MORICHES,Long Island,Jurgielewicz's family duck farm believed to be the only major free-range duck farm in the United States.I understand Long Island Pekin white duck, is a delicacy for chefs around the world. 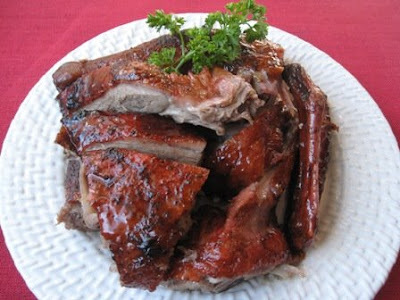 They said Long Island Pekin duck is mild and tender meat; it’s just perfect. I never try to make or cook duck until now. Actually Moriches duck farm is not far from me and since I live in Long Island ,I better try it now.New York Times had few articles about Long Island 's duck farm with positive reviews.Even friends who own restaurant business told me Long Island 's duck is the best! Now it's proven they all are right!! 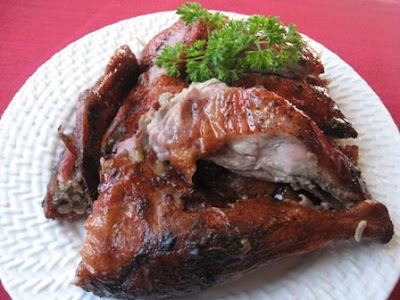 Last week I make Crispy Roast Duck ,actually it's not hard at all and hubby was very impressed with the result!! He almost finished the whole duck and left few pieces for me.Well, I'm not a duck fan but now I changed my mind after roasting my own duck..
1:Remove plastic bag cover thawed duck,then remove and discard excess fat from body cavity and neck. Prick skin all over very thoroughly with a fork on both sides (25 to 30 pricks for each duck or as many times as you can to make the skin crispy). 2:Prepare a large pot or bin with cold water ,squeeze cut oranges and add few drop of red coloring.Then let the clean duck dip/soak into the cold water mixture for 2-3 hours . 3:Preheat oven at 350 F.Remove duck from cold water and pat it dry with paper towel.Rub salt and 5 spices powder all over the duck.Line up an aluminum foil over a roasting pan (to prevent deep scrubbing). 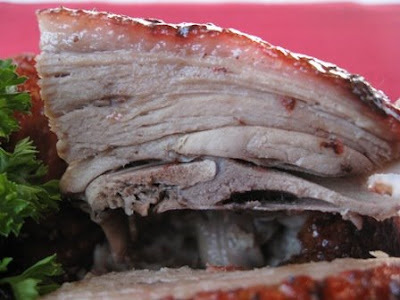 4:Place duck onto wire rack of the roasting pan ,breast facing downward,in the middle rack of oven .Use bake setting to roast for 40-50 minutes,then turn the breast facing upward,roast for another 45 minutes to 1 hour or until golden brown . 5:Remove duck from oven brush with maltose all over the skin, let it sit for 10-15 minutes before carving.Serve warm as main course. wow! looks like those served at the restaurant! I just love roast duck but never attemt to roast one. Now looking at your mouthwatering duck I am so tempted to do it. I saw on Food Network about the review on Long Island duck. Let me see if I can find them here if not I just have to wait and get one when I visit you. Good job Lesley! Wow, this looks fantastic! I'm sure it's worth all the effort! 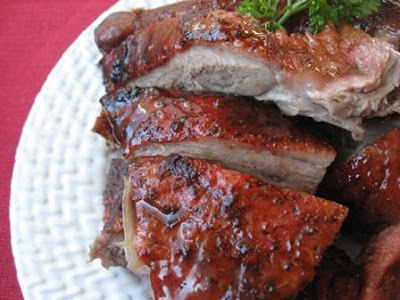 wow...your Peking Duck looks so yummy and it's make me hungry lor!!! 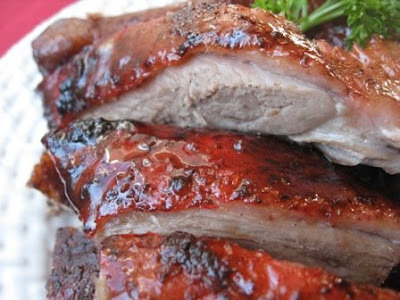 Got to try this recipe and I'm going to find this duck at the Asian grocery store this weekend. Thanks for sharing!! next time spare some for me too. i love crispy duck! yours are just like those at the restaurant!! well done! WOW that looks so DAMN good!!! Wow, bravo, I'm impress, it really look like store-bought. Gert,thank you:)...I bought my duck at "lohfan" market here..a pound for $2.65..not bad yea..going to get one this weekend for loh ark!! try to look at local american market frozen section.. I know the best part of duck is the crispy skin but we throw away especially the fats part...luckily you can afford to eat skin!! thank you,can't wait to see your roast duck posting soon! Thank you:) try roast for your daugther and hubby..actually it's not really hard..
wow that looks so good! When you cut the oranges do you squeeze it and use the juice or do you just place them in there. thank you:) I squeeze the oranges juice into the cold water,to soak the duck together ,it's kind to give some citrus flavour. Wow! The skin looks perfect, looks like the ones hanging in chinatown! Homemade roast duck ? Wow, you are wonderful. It looks as good as those served in restaurant, drool ! Wow,Lesley, now I am really motivated! I usually buy my roasted duck at an Asian supermarket in Sacramento and I always say that's the best tasting duck any where! 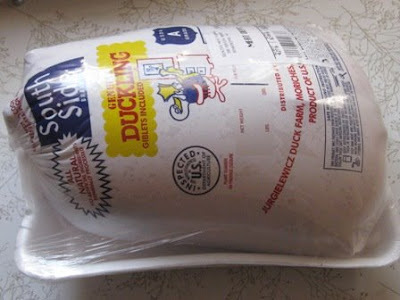 Now though,I should try roasting one, because I know there is frozen duck for sale at the local supermarket. Doesn't look difficult at all judging from your experience! Hi Beachlover...wandering what should I do with the leftover dripping oil from roasting the duck?? Any recipe for that??? That is one amazing-looking duck! Gorgeous colour and so very juicy! Somebody necessarily help to make significantly articles I would state. That is the first time I frequented your web page and thus far? I surprised with the analysis you made to create this particular post amazing.